Completed lines are in Red, planned lines never built are in Blue. The Nevada-California-Oregon had its roots in Western Nevada in the late 1870's. In December 1879 a group of investors headed by one John T. Davis formed the Western Nevada Railroad Company to build south from Wadsworth, NV to the Walker Lake region. As additional investors became involved the base of operations shifted to Reno, and the projected railroad stretched from Bodie, CA, north through Reno to the Columbia River. The company re-incorporated into The Nevada & Oregon Railroad, later changed to Nevada & Oregon Railroad. The early history of this company is filled with corporate intrigue and shenanigans, including one Board of Directors meeting that ended in a gunfight between opposing factions and a period of time when two separate Boards claimed direction of the company. The first shovels broke ground on the new venture in Reno on 22 December 1880. The corporate situations outlined above coupled with a general lack of money kept actual construction at a slow pace. The company decided early on to start the line north from Reno first. Grading progressed slowly to the north, and the first rails were spiked down on 28 May 1881. Narrow gauge fever was sweeping the country at the time, and the allure of cheaper initial construction costs was enough to convince the N&O to build its tracks with three feet between the rails as compared to the 4 feet, eight and a half inches between the rails found on standard gauge tracks. By 8 September 1881 construction crews had finished twenty one miles of grade and ten miles of track. The completed railroad stretched to Oneida, thirty miles north of Reno, by September 1882. The company commenced regular service over the completet track on 2 October of that year. The Moran Brothers, a New York banking firm, had been one of the early and most prominent investors in the Nevada & Oregon. On 17 April 1884 the Morans took full control of the railroad when they purchased the company at a court ordered auction. They were the only bidders at the sale, and thus their bid of $372,534.21 carried the day. The original N&O stockholders had six months in which to redeem the property, but they had no money to work with. With the Morans the railroad finally found relatively firm financial footing and constant leadership, and northward construction once again picked up. The railroad also got a new name, the Nevada & California Railroad, in January 1885. A postcard of N-C-O's Reno Depot. Postcard from the Roger Titus collection. Northward construction resumed in October 1885. The rails reached Junction, at the foot of Beckwourth Pass, by the end of 1884. Construction resumed in 1887, with the next effort carrying the railroad up along the eastern shores of Honey Lake. Susanville had long wished for a railroad, and the citizens of the town became so disgusted with the narrow gauge's choice of route bypassing the town that many merchants chose to team supplies to and from Chico instead of patronizing the more local railroad. The end of 1888 found the railroad at a point known as Liegan, 70 miles north of Reno. The next extension took the railroad to the newly established town of Amedee, where construction stopped. The company spent the next several years improving the lines already constructed and trying to build business up. Various financial panics in the east also made additional construction capital impossible to find. On 1 January 1893 the name of the railroad changed again, this time to the Nevada-California-Oregon, a name that would stick with the company through the rest of its existence. The initials- NCO- prompted at least two nicknames for the railroad, the "Narrow, Crooked & Ornery" and the "Northern California Outrage". The next northward extension commenced in 1899, and by June 1900 fifty additional miles of track had been spiked down. The next year saw 14 more miles go down, extending the railroad to the small town of Madeline. Construction halted until June 1906 when the next phase started, with service extended to Likely by October 1907 and Alturas by December 1908. Construction pushed north from Alturas, with Lakeview, OR reached on 10 January 1912. 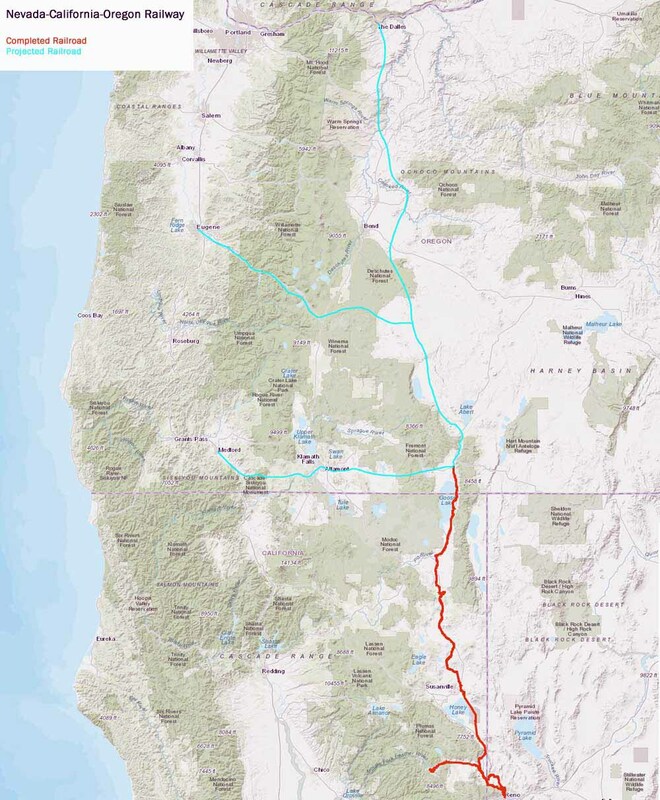 It took the company 32 years to build the 238 miles of railroad from Reno to Alturas; the company charter indicated plans to continue north through Prineville to The Dalles on the Columbia River, with one branch running through Klamath Falls to the Rogue River Valley and another running to the Eugene area in the Willamette Valley, but no further construction ever took place. It is interesting to note that during the same time period that the N-C-O built north from Alturas the Sumpter Valley Railroad, also narrow gauge, pushed a line of their railroad west as far as Prairie City, OR, with the stated intentions of connecting with the N-C-O somewhere around Prineville. If this had come to pass it would have been possible for one to ride in narrow guage cars nearly all the way from Baker City, OR, to the south end of the Owens Valley in Southern California, with the only standard gauge portion of the trip occuring on the rails of the Virginia & Truckee Railroad from Reno to Mound House, NV. The N-C-O survived as an intact railroad for only six years. In 1917 the railroad sold the 64 miles south of Hackstaff to the Western Pacific Railroad for $700,000. WP abandoned a portion of the N-C-O that paralleled its mainline and coverted the rest to standard gauge to become its Reno branch. N-C-O left Reno for good on 30 January 1918. Reno had been the location of the company's headquarters and shops since the beginning, and the company relocated these facilities to Alturas. The next cutback came in October 1922 when the 16 miles between Hackstaff and Wendel came out. By this point the railroad was in a critical financial situation, and the Morans were looking for a way out. Relief for the Morans came in 1925 in the form of a Southern Pacific offer to purchase the company. The two companies signed an agreement on 30 April 1925, and SP took control in October 1926. SP converted the railroad to standard gauge between 1927 and 1928. SP sent much of the N-C-O equipment they inherited south to their narrow gauge system in California's Owens Valley. SP maintained the original N-C-O name on standard gauge equipment assigned to line until 1 September 1929, when the line became part and parcel of SP's system. Thus ended the life and times of one of the most interesting and colorful narrow gauge railroads in the west. Had the N-C-O achieved its initial plans the railroading history of Oregon's high desert region may have been written very differently. 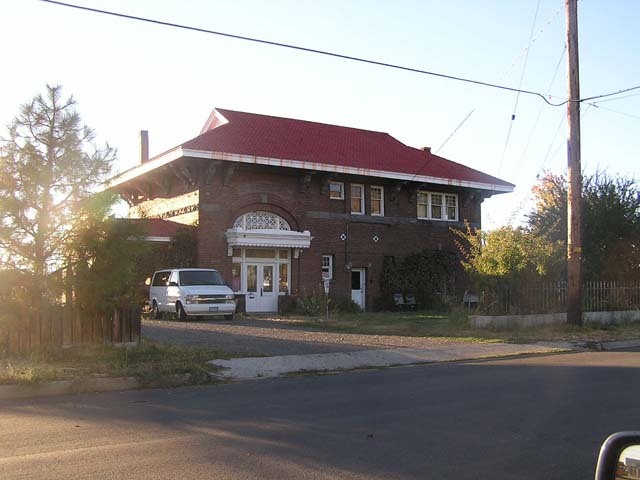 See the Modoc Line and Lakeview Branch sections of the Southern Pacific page on this site for the history of the N-C-O trackage after that railroad took over. N-C-O's two story brick depot in Lakeview,now a private residence. Fred Harrison photo. "Railroads of Nevada and Eastern California, Volume 1", David F. Myrick, Howell North Books, 1962. "The Modoc, Southern Pacific's Back Door to Oregon", Jack Bowden and Tom Dill, Oso Publishing Company, 2002. "Southern Pacific's Shasta Division", John R. Signor, Signature Press, 2000. "Rails to the Ochoco Country, The City of Prineville Railway", John F. Due and Frances Juris, Golden West Books, 1968.